Theresa May is travelling to Mozart’s birthplace, Salzburg, in a bid to find some much-needed harmony on Brexit at a two-day summit of European leaders. And an eve-of-summit pledge by the EU’s chief Brexit negotiator, Michel Barnier, to break the deadlock on the Irish border will have been music to her ears. Speaking in Brussels, Mr Barnier said he was ready to come forward with an improved proposal on the border that would respect the “territorial integrity” of the UK. He said the next full summit of EU leaders, in Brussels on October 18 and 19, would be the “moment of truth” on whether a Brexit deal could be reached. “It is then we shall see whether agreement we are hoping for is in our grasp,” he told a news conference at the European Commission after talks with foreign ministers. In talks at Salzburg’s Mozarteum University, the Prime Minister will yet again try to persuade the EU leaders her much-derided Chequers plan hits the right note. The plan, agreed by the Cabinet at Chequers in July and followed by the resignations of David Davis and Boris Johnson, seeks to maintain free-flowing trade in goods by maintaining common rules with the EU post-Brexit. She also claims demands for a second EU referendum risks shattering trust in Westminster, declaring: “We gave people the opportunity to make a choice. On Brexit negotiations, she says: “The withdrawal agreement is virtually agreed. Chequers is about the future relationship. A senior Downing Street source said the PM would tell EU leaders in Salzburg that Britain was proposing “a fair arrangement that will work for the EU’s economy as well as the UK’s”. The source told the Reuters news agency: “To come to a successful conclusion, just as the UK has evolved its position, the EU will need to do the same. 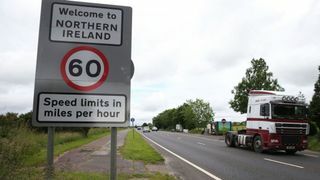 The border between Northern Ireland and the Irish Republic has become the main obstacle to an agreement ahead of the UK’s withdrawal from the EU in March 2019. The EU has proposed a “backstop” which would see Northern Ireland remain in Europe’s customs union in the event of no deal, to avoid the return of a so-called “hard border”. But Mrs May has rejected that plan as unacceptable, claiming it would effectively create a border in the Irish Sea between Northern Ireland and the rest of the UK. 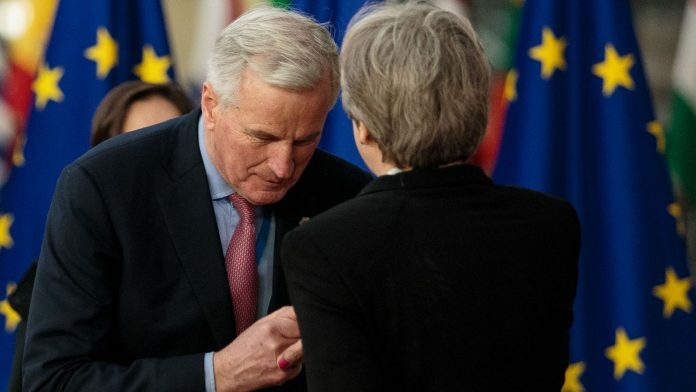 Addressing those concerns, Mr Barnier said he was working on a plan to “de-dramatise” the controls that would be necessary in the event of the backstop coming into play. “We are ready to improve this proposal,” he said. “Work on the EU side is ongoing. “We are clarifying which goods arriving in Northern Ireland from the rest of the UK would need to be checked and where, when and by whom these checks could be performed. He added: “What we need in the withdrawal agreement is a legally operational backstop which fulls respects the territorial integrity of the UK. Mrs May and her Cabinet allies have already been encouraged by a claim by Mr Barnier last week that a deal might be possible within six to eight weeks. It is also thought the German Chancellor Angela Merkel favours a quick slimmed-down deal that puts off some of the biggest problems, like the Irish border, until after Brexit. This short-term approach was also hinted at by the Environment Secretary Michael Gove when he said in a TV interview on Sunday that the PM’s Chequers plan was the “right one for now”. Mrs May will be hoping for a diplomatic breakthrough and some harmony at the Mozarteum. But she will still face noisy discord from Tory MPs when she returns to Westminster.